Monday - Sunday 6 a.m. - 4 p.m.
U.S. Annual Registration is now available! Give them a call at DSN 757-2278 (COMM 05033-57-2278) for more information or visit them at the club house! Click here to download the U.S. Annual Fee form. Monday - Sunday 8 a.m. - 4 p.m.
9 Hole is also available. Start times are seasonal. See Pro Shop Staff for details. Payment of an Advanced Annual Green Fee entitles the patron use of the course for daily play, subject to tee time availability, course conditions and weather. Patron fees are based on employment (if applicable) or status within command. Annual renewals are based on the golf season, commencing 1 April and ending on 31 March. New patrons joining after 1 April will pay a fee equal to 1/12 of the applicable annual rate, for each whole or partial month remaining in the golf season. Patrons departing Korea on official orders are eligible for refunds. Our White Heron signature specialties are served with our Culinary Teams appropriate "Fresh" seasonal compliments. Only 2% of all beef graded by the USDA qualifies for “PRIME” distinction. Aged a minimum of 21 days, hand selected. All steaks are hormone, antibiotic and steroid free. Roasted Fresh Asparagus "Roman Style"
Friday and Saturday features our renowned creekstone angus prime rib selected from the top two thirds of all USDA Choice Beef grade or higher. Classic prime rib of beef au jus slow roasted to perfection. Prime cut of whole ribeye served with our house chopped salad, choice of two White Heron Compliments and red wine demi-glace or horseradish creme sauce. Soup of the day. Our culinary teams creation of the day. All our specialty burgers and sandwiches are served with your choice of graden salad, cup of soup, house fries or coleslaw. Our special blend of fresh USDA Choice Beef hand-pressed and grilled, served on a toasted brioche roll. Choose your cheese (American, cheddar, Swiss or Monterey Pepper Jack). Served with warm bread with whipped butter and garden side salad. Daily Chef’s Plates are served with a choice of garden salad or soup of the day plus beverage (Tea or Soda). 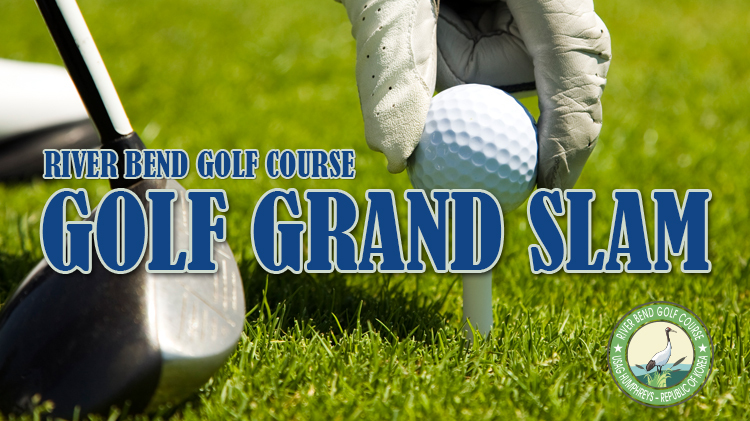 Join us for two days of all things golf at the River Bend Golf Course's Grand Slam event!